Richie Whitt's DFW Sportatorium: So In The End Johnny Goofball is Guilty. And Free? So In The End Johnny Goofball is Guilty. And Free? Johnny Manziel got from Point A to Point B at a rate that suggested he couldn't have possibly traveled any slower than 93 mph. There was, however, no radar data of the event. Bottom line: Johnny Goofball will sit out a half of football Saturday in a game that he, yep, probably would've played only one half. The Aggies will destroy Rice on the opening weekend of college football. Manziel will both throw and run for touchdowns. And the NCAA again looks like damn, hapless fools. I'm going to assume the joint NCAA/A&M release was written with a straight face. Though offering a plea bargain to a suspect guilty only of an "inadvertent violation" is laughable. If the NCAA can't prove he took cash for signing autographs, it shouldn't suspended him at all. Not a play. Not for a half. Not for a second. We all know Johnny Goofball was paid. No human with any common sense would spend time signing 4,400 autographs for zero compensation. The NCAA says the "punishment" somehow "closes the book" on the Manziel investigation. The sacred Aggie Code has been compromised by Manziel's breaking rules and lying to survive. But the biggest loser is the NCAA, which has taken another giant step toward total irrelevancy. And Johnny Goofball is somehow an accessory to a non-crime. I haven't heard anyone talk about his lawyer, but is there any chance that since this guy had experience with the NCAA that he straight out threatened a class action lawsuit? I can't imagine after the Ohio State and Dez Bryant suspensions that the NCAA wouldn't have been able to find enough on Manziel to at least suggest to A&M that if they found out anything else in the investigation that they would forfeit games that he played in this season. 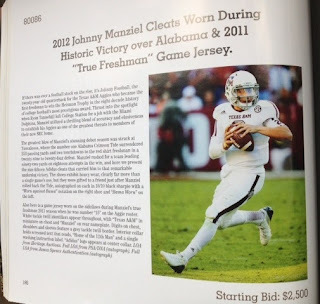 I'm not willing to throw the race thing out there, because Cam beat the NCAA as well, but, I foresee down the road in a few years or more that Manziel comes clean once players are getting paid and admits that he got paid for autographs. I don't worry about the NCAA making A&M forfeit this year's games simply because I don't think the NCAA is long for the way it's constituted currently. So if I get (insert any relevant football player in your college town) to make appearances at a sports bar in (insert same college town) as long as the money comes to me they just need to sit out the first half of the equivalent of an NFL preseason game? Wonder what the SMU alums think about a bunch of Aggies outsmarting the NCAA like this.